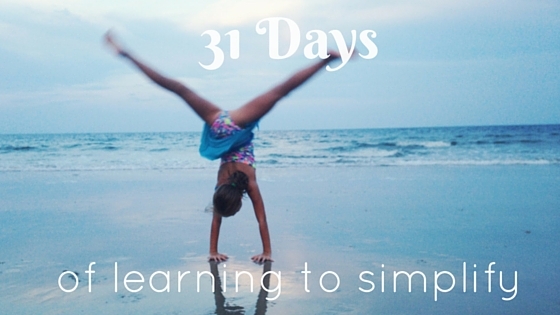 31 Days of Learning to Simplify: But why? Here we are! My first official Write 31 Days post (because yesterday was just the intro)! This is an experiment in simplifying my entire life – from my home to my heart to my makeup routine. I will cover it all. But why is this important? And why now? Honestly, I didn’t think it was that significant at first. Earlier this year I just kept getting the same message loud and clear from the Lord: simplify. free your life up. busy is not better. slow down. be minimal. have less. Less of what, God? His response: less material items, yes, but also less worry, less commitments, less critical self-talk, less judgement of others, less arguing. It has taken me some time, but I am now starting to understand why He has called me to a quieter life. When there is less clutter surrounding me, more of God can fill my life. I can fully focus on Him – His ways and His purpose for me. I can see the bigger picture. There are so many changes happening in my life right now and more than anything, I want to recenter and confirm where He wants me to go every step of the way. Too much noise has kept me distracted until now. When you clear out all the junk, you’re left with only the important things, the things you really treasure. Now that we’ve covered some of the Why, now we can start the What. Tomorrow we dive in with something easy and superficial – wardrobe! See ya then!